Last night a few friends and I gathered at Pamplemousse Grille, the local restaurant of choice for us because of our friendship with Jeffrey Strauss and his outstanding staff. Jeffrey is kind enough to allow us to BYOB with our personal gems so in keeping with our promise to never not reciprocate we tip the amazingly polished staff very, very well and always share the bottles with his entire team. The food is always as great matching up so well to the wines, and regardless of the pace of the evening, nothing is ever left to chance. For last nights dual birthdays of two long time wine loving friends a variety of wines came from the collections of three of us, including a 2003 Screaming Eagle and both 1999 and 1984 BV Private Reserve George De Latour Napa Cabernets. The Screaming Eagle was everything you have ever heard or read about. A trophy to be appreciated. It's got power, grace, structure, balance and yes it does cause envy. The 84 BV was something of an anomoly. The cork showed hardly any aging. It was to say the least, pristine. The wine was aged. Not old and not tired. But aged. Having gone through now the last of the 18 bottles I accumulated back in 1989 when in a trip with Doug Kaplan across Napa Valley it was a testiment to what the winery was doing well for so many years. Gone was the bright cherry flavor that was there when young. Instead it was briary with hints of leather, sweet cigar tobacco leaf, some sour cherry. 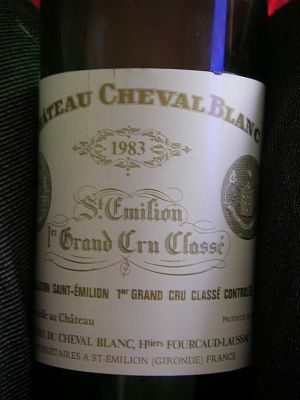 But as the bottle opened, and then was decanted the wine showed me once again why the 1984 BV was the better bet over the more heralded and far shorter lived 1985. There were two other wines of note that blew us all away. The 2001 Le Petite Cheval and the 2002 Cheval des Andes, all made by the same wine family behind Cheval Blanc were stunning examples of Cabernet Franc. Both were balanced, rich and almost sublime in their flavor profiles and showed no signs of aging, nor any signs of anyone not wanting to finish the entire bottles. They were each in their own way perfect examples of winemaking done right.